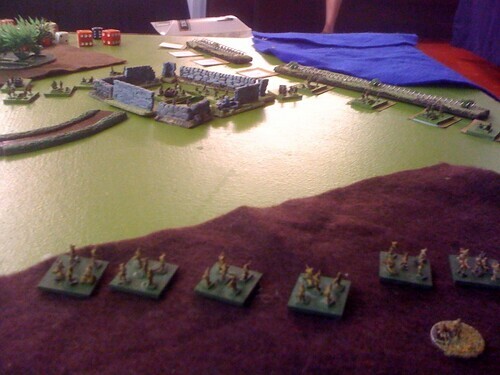 A couple of us at the club have been playing through the Two Fat Lardies campaign book Bloody Burma. Proph and I have been using the Blitzkreig Commander rules with 6mm Japs and Brits and it’s been a lot of fun. So far we have played out 5 of the 24 scenarios and each game has been something of a corker. The scenarios played have been knife edge affairs with at least 3 of the games being decided on the final turn. Tonights game was no exception to that. The scenario essentially played out an assault by Japanese forces into the rear of a prepared British/Indian line – a line set up to expect an assault across a river. The British objective was to exit as much of its force off the table edge furthest from the river, the Japs just needed to wipe out the defenders. The table was typical for the games we have played so far – dense jungle restricting LOS and effective ranges meaning combat had to be up close and personal – lots of dice rolling for close quarters fighting. Early turns saw a lot of movement with Jap forces heading down each flank with one unit covering the line of retreat up the road. The Jap right flank became too strung out, not helped by some epic command rolls from the British CO that saw a fair proportion of his troops merrily speeding up the table away from the advancing Japs. At this point the Jap CO made his near fatal error, splitting his command in two. One group headed for the vacated trenches to attempt an assault on the command post. The other headed up the hill to try and head off the retreating Brits. Some excellent shooting from the command post coupled with reduced command effectivness thanks to distance meant that big holes appeared in the Jap right flank. Spotting the opportunity the British attempted to take the hill overlooking the road, currently occupied by a small unsupported Jap force. The Japanese position looked precarious. Luckily a plucky Jap officer was able to move his unit into an assault position against two British squads placed to protect the rear of the main force. The main British force was just out of range to support the unfortunate squads and they were wiped out in close combat. Despite this the main bulk of the British units successfully assaulted the Japanese infantry on the hill, driving them back and overrunning the CO, forcing him to flee into the jungle. With holes opening all along the Jap right flank it looked like the British troops would escape with a crushing victory. That Jap officer had other ideas. The japs moved quickly through the village to take the main block of british units in the rear, out in the open. Withering fire took out several squads and the success drove the infantry forward to assault the remaining British defenders. The British survivors broke and ran into the jungle to try and regroup. The Japs were left in possession of the defensive positions having effectively wiped out any resistance. This was a close game – lucky rolls on consecutive turns (double 1 in BKC allows you to issue two orders instead of one) saved the Japs. If that officer had not been so lucky the British would easily have overwhelmed the troops on the hill and made off into the Jungle for the victory. Had the Brits been able to exploit the collapsing Jap flank a turn earlier they probably would have made it. I was convinced as the Jap player that I was well beaten. What has been great about this campaign series has been how close the gaming outcomes have been to the real word outcomes. They have been very well balanced games and great fun. Playing BKC with no armour on the table, using Jungle rules which force you to get up close and personal has been really interesting and proven that the rules are not just for major tank battles with infantry playing a poor second fiddle. It’s also been refreshing to play BKC as a scenario/narrative game rather than as a points vs points game. It’s held up well to the narrative approach, thanks no doubt to the excellent balance achieved by Robert Avery. We are still here, honest!